Б\у, состояние на 4, без деффектов. 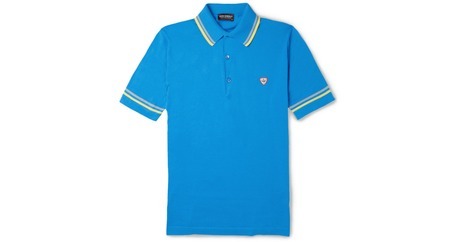 Размер М.
John Smedley: Sea Island cotton is undeniably luxurious, and John Smedley makes the fabric look relaxed and refined with this bright blue knitted polo shirt. With its striped tipped trims and chest emblem, this piece has a sporty energy that will look great as part of your off-duty ensembles. Just add contrasting coloured jeans. Bolster your weekend wardrobe with a dash of Mr Billy Reid's rustic charm. 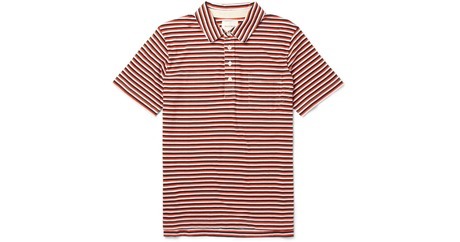 This cotton-jersey red, navy and white striped polo shirt features signature detailing such as the contrast placket lining and mother-of-pearl buttons, making it every inch the considered choice. Team it with slim chinos and boat shoes.